Art experts believe they have identified a new Leonardo da Vinci - in part by examining a fingerprint on the canvas. Peter Paul Biro, a Montreal-based forensic art expert, said Tuesday that a fingerprint on what was presumed to be a 19th-century German painting of a young woman has convinced art experts that it's actually a da Vinci. If experts are correct, it will be the first major work by da Vinci to be identified in 100 years. Biro said the print of an index or middle finger was found on the painting and that it matched a fingerprint from da Vinci's St Jerome in the Vatican. Biro examined multispectral images of the painting taken by the Luminere Technology laboratory in Paris. The lab used a special digital scanner to show successive layers of the work. Technical, stylistic and material composition evidence also point to it being a da Vinci. 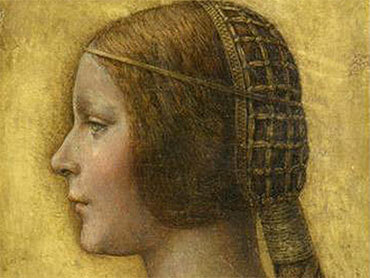 Biro said there's strong consensus among art experts that it is a da Vinci painting. "I would say it is priceless. There aren't that many Leonardo's in existence," Biro said. He said he had heard that one London dealer felt it could be worth 100 million British pounds (more than $150 million). Silverman said his Swiss friend saw it first and told him it didn't look like a 19th century painting. When Silverman took a look at the painting at the Ganz gallery in 2007, he thought it might be a da Vinci, although that seemed far-fetched. He hurriedly bought the painting for his Swiss friend and then started researching it. Last year, Silverman bumped into Nicholas Turner, a former curator of drawings at the J. Paul Getty Museum and the British Museum. Turner said it was a da Vinci and other leading art experts have backed it up as well.